This is another whiskey distilled from beer and another sample from Sku, who we learned so much about a couple of days ago. This is a rather sober label, and doubtless represents Sku in the grip of his super-ego. But enough nonsense. I’ve reviewed another Charbay distilled from hoppy bottle-ready beer before, and while I thought that was an interesting diversion this one is a completely different beast. While that R5 was very young (probably less than 2 years old, quoth Sku) this one is 12 years old. And it wasn’t a regular release; it was bottled for the Los Angeles Whiskey Society (Sku is a member, which says a lot about them, I think). This has received a lot of rave reviews (from Serge, for example) and Sku says it may be his very favourite whiskey. Me, I’m only hoping that it won’t be as bad as the Whipnose. 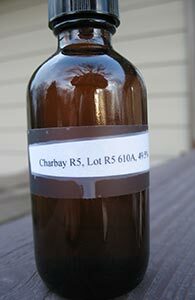 Charbay are an outfit in northern California who make a wide range of spirits and wines. Among whisky geeks they’re best known for a few releases of rather expensive whiskey made from pilsner beer. While all whisky is in a strict sense distilled from beer Charbay use beer made for commercial release. And what’s further unusual about their whiskey–including the one I am reviewing today–is that it is made from hopped beer. This is, in fact, rather different and I’m curious to see what this whiskey—distilled from Racer IPA—is like, though also somewhat wary. There are two versions of the Charbay R5, which is double-distilled in a pot still, Scotch style–one unaged, and the other aged in French Oak casks. This is the latter.